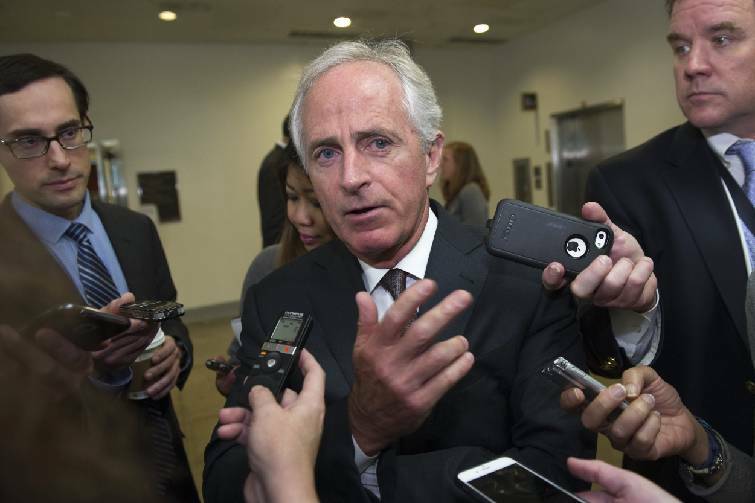 NASHVILLE -- A Washington-based group says it is filing complaints today with both the Securities and Exchange Commission and the U.S. Senate Select Committee on Ethics, alleging that Sen. Bob Corker, R-Tenn., may have engaged in "insider trading" and made false statements on his Senate disclosure forms when buying and selling stock in Chattanooga-based CBL & Associates Properties Inc. In its request to the SEC and the Senate ethics panel, the Campaign for Accountability (CfA) says in a news release that "based on his trading pattern, it appears that on several occasions Sen. Corker likely received material, non-public information from either a UBS [bank] or CBL insider." The Campaign for Accountability filed a complaint saying Sen. Corker may have engaged in insider trading as well as making false statements on his Senate personal disclosure forms when trading shares in Chattanooga-based CBL & Associates Properties Inc.
Sen. Bob Corker, R-Tenn. speaks with reporters on Capitol Hill in Washington, recently. A Corker spokesperson charged "these baseless accusations from a political special interest group are categorically false and nothing more than a smear campaign." The spokesperson said Corker "always has disclosed to the public that he invests in CBL since he first held stock in the company back in 2007. The accounting firm that worked on his financial disclosure reports properly listed the sale and gain or loss of transactions, but some did not list the day they were purchased, so after completing a full review, we are correcting this technical oversight." The complaint follows last week's Wall Street Journal article which stated Corker, a former Chattanooga mayor, has made dozens of short-term trades in CBL, one of the nation's largest shopping mall owners and operators. The Journal also reported that Corker, who prior to his 2006 election made millions as developer and owner of office buildings, had not made public in his Senate ethics filings a dozen stock purchases in CBL, including several that resulted in his most profitable investments. Corker, who in response to the newspaper's inquiries amended the disclosures to reflect the trades, is blaming his accountants for omitting specific information outlining dates and details of the trades. In their release, the CfA says Corker made "an astonishing 70 trades" in CBL. "Some of the trades closely preceded company announcements that led to changes in the stock's price and seemingly resulted in the senator making millions of dollars." Anne Weismann, CfA's executive director and former chief counsel for another watchdog group, stated that the former Chattanooga mayor's "trades followed a consistent pattern — he bought low and sold high. It beggars belief to suggest these trades netting the senator and his family millions were mere coincidences." The Journal has reported that Corker has bought or sold CBL stock for himself 45 times. He made the additional trades for wife as well as through trust accounts established in the names of his two daughters. In one previously unknown purchase, Corker, a member of the Senate Banking Committee, purchased between $1 million and $5 million in CBL in late 2011 and sold them five months later for a 42 percent gain. Congressional ethics rules require lawmakers to make public their financial investments in broad ranges each year. The Campaign for Accountability alleges Corker's profitable trades in CBL were made in advance of his broker, UBS, issuing reports impacting CBL's trading price. Corker recently amended his filings to reveal a 2009 purchase of between $1 and $5 million of CBL stock, sold just five months later in 2010 at a 42 percent profit. CfA says Corker made purchases worth between $3 and $15 million in 2010 and, just after his last trade, UBS said it was upgrading its outlook. The stock then went up 18 percent. The group says Corker shortly thereafter began selling. A week later, the group says, UBS downgraded the stock and the share price soon declined about percent. It also charges in its news release that "as a member of the Senate Banking Committee, Sen. Corker has advanced legislation that would financially benefit UBS and CBL. If Sen. Corker's trades were based on material, non-public information he received from anyone with a fiduciary duty to CBL or UBS in return for any benefit, the senator may have engaged in insider trading. And, if the senator knowingly failed to report his CBL assets, he may have committed the crime of making false statements." "When Sen. Corker advances legislation beneficial to UBS and CBL is it because he thinks it's good for the nation or just good for his bank account?" Weismann said. "The SEC and the Senate Ethics Committee should investigate and find out." In a statement last week, Corker said he had done nothing wrong and blamed his accountants. "I am extremely disappointed in the filing errors that were made in these earlier reports where the accounting firm mistakenly used realized gain/loss methodology instead of the Senate financial disclosure guidelines," he said. "Therefore, in a few cases, only the sale and gain or loss of the transaction was reported. As a result of this inquiry, and after completing a full review, we are correcting this oversight." His office also said last week "the accounting firm that worked on his financial disclosure reports properly listed the sale and gain or loss of some transactions, but did not list the day they were purchased so after completing a full review, we are correcting this technical oversight." The senator's accountant, David DiStefano, a partner at G.R. Rush & Co. PLLC, explained in a Times Free Press interview last week that "we have many of the tax documents that we have used in preparing his tax returns that include gain and loss statements from various brokerage firms. Therefore, we would go through those reports and pick up all the sales of securities the best that we could and report purchases of securities, as well. "But," DiStefano added, "we didn't have a detailed transactional report from the brokers that showed every single transaction every month. There was a potential to miss one, and we certainly did." The Campaign for Accountability says it uses research, litigation, and "aggressive communications to expose misconduct and malfeasance in public life and hold those who act at the expense of the public good accountable for their actions." The group was formed as a nonprofit group earlier this year, said spokesman Daniel Stevens in an interview. Weismann formerly worked at the watchdog group Citizens for Responsibility and Ethics in Washington. A listing of Campaign for Accountability's leaders on its websites show several people with ties to Democrats. Its says one of them, Nick Hackworth, has over a decade of experience in all levels of political research and most recently served as director of strategic research for President Barack Obama's 2012 re-election campaign. But Stevens said the group is nonpartisan. He pointed to the Campaign for Accountability's request that the House Office of Congressional Ethics investigate 11 members for possible criminal and ethics violations by accepting contributions from the payday lending industry shortly before or after taking official actions in support of the industry. The list included two Democratic congressmen, according to a news release. Contact Andy Sher at asher@timesfreepress.com, 615-255-0550 or follow on twitter at AndySher1.